It is important to link Palestine Youths to their lands, routes and identities, especially during the times when identities, belonging and goals are lost. 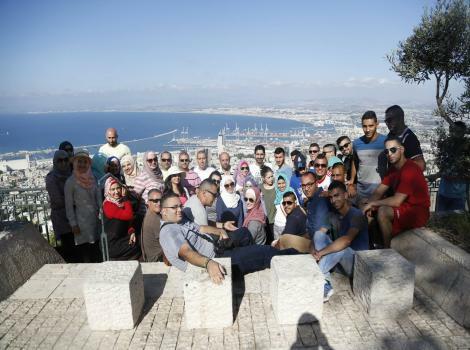 Thus, Burj Al-Luqluq Social Center Society organized a two-day tour to the North of Palestine for the participants in The Young Guide Program. During the tour the group visited a number of sites including Im Al-Zinat Vilallage, Balad Al-Shaikh Village, a tour around Haifa and camping in Kapul village “Al-Sindibad Resprt”, where the group camped for one night to continue their tour on the following day around Ras Al-Naqura and Akka. This tour is one of “The Young Guide” program tours that comes within Shababek Ya Quds project, funded by the Jerusalemite businessman Munir Al-Kalouti and supervised by the Welfare Association. This program aims to connect the Palestinian identity with the Palestinian land from North to South and from sea to river.